This article is about the Creation. For the house itself, see Tundra Homestead (place). Tundra Homestead is a Creation that adds a cottage east of Whiterun, which can be purchased from the city's steward. It was released on April 5, 2018 for 300 CC Credits. This Creation was made by Elianora, the author of many Skyrim housing mods. This Creation adds Tundra Homestead east of Whiterun. The cottage is initially locked, and there is a note outside that tells you to buy it from the city's steward. Buying the property gives you the typical objective to visit your new home. Tundra Homestead comes fully furnished, unlike all other houses except Severin Manor in Raven Rock. It is a small house with two floors and an exterior estate. 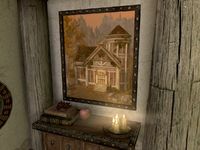 There is no prerequisite quest, making it the simplest house to obtain, though at 7,500 gold it is slightly more expensive than a fully furnished Breezehome at 6,800 gold. The property contains many crafting stations, including a "Baking Surface" which acts as an oven for access to the baking recipes added by Hearthfire. It also possesses a large display room in the cellar, with places to store unique items such as dragon priest masks and bugs in a jar. This Creation uses an .esm file rather than .esl to store its data. This page was last modified on 11 January 2019, at 10:22.